While Reserve Bank of India (RBI) has denied as rumours that every Rs 2000 note has a GPS-chip in it, which would be able to tap its movement from a satellite, a top Indian Institute of Management-Bangalore professor, R Vaidyanathan, who was the main brain behind the demonetization move, has said that the new notes do have radio frequency identification (RFID) tags in them. Suggesting that this is what he has gathered, Vaidyanathan seems sure, “The new notes have some tracking mechanism in them. ” Vaidyanathan first openly declared the need to demonetize Rs 500 and Rs 1000 notes way back in 2012, which is reportedly the basis of the Modi idea to go for it. Vaidyanathan, significantly, was part of the task force which the BJP set up on January 31, 2011, to suggest measures to tackle black money. While the task force did submit a slew of recommendations on how to combat the menace, the party in its 23 recommendations furnished in a 95-page report did not refer to the need to demonetize Rs 500 and Rs 1,000 denomination notes. 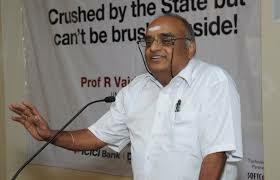 However, even then, Vaidyanathan had been of the view that there is a need to scrap “high-value notes” as a measure to counter the hoarding of black money, something that he continued to doggedly insist on ever since. After Modi came to power, he began being consulted more often than other experts on issues of black money. In fact, it is Vaidyanathan’s proposal which found “wide acceptance among the key people involved”, says a report. He reportedly held discussions with Doval, in which a few senior officials from the RBI too were roped in, and informal discussions began with key bank officials from the public and private sector on how to demonetize Rs 500 and 1000 notes. However, Modi did not pay heed to this view, but announced introduction newly designed notes of Rs 500 and 2000, with possibilities of introduction of Rs new 1000 notes, too. It is not known whether Vaidyanathan thinks Modi has done the right thing.